Background: Genomic Islands (GIs) are commonly believed to be relics of horizontal transfer and are associated specific metabolic capacities, including virulence of the strain. Mannheimia haemolytica is a commensal, Gram-negative bacteria found in the upper respiratory tract of livestock. Amid stress or immune compromised conditions of the host, the bacteria known to induce malady. Aim: This study aimed to predict Genomic Islands in M. haemolytica genomes and virulence factors associated with these Islands. Further, we aimed to trace the donors of these horizontally transferred Islands. Methodology: Genomic Islands predicted with Ensemble algorithm for Genomic Island Detection (EGID) tool, data analysis and visualization done with self written shell scripts. And the putative donor predictions of horizontally transferred Islands with the aid of a frame work developed in our laboratory. Results and Conclusion: The study recognized distinct regions of the GIs of M. haemolytica M42458 which imparted with the other strains. A cluster consisting of six ORFs of M. haemolytica M42548 was common to all strains. About 22% ORFs of predicted GIs of M. haemolytica M42458 unique to itself. Data mining for association of virulence factors with GIs suggested that horizontal transfer played important role in hustling the virulence factors like adhesions, Outer Membrane proteins (ompA) and Type IV Secretion systems. 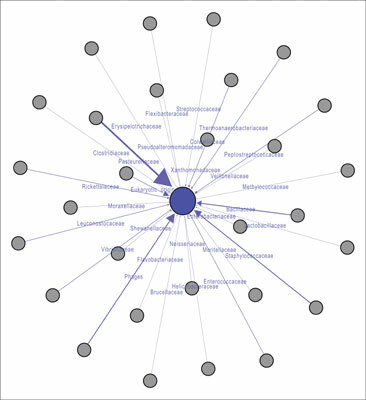 And, also acquired antibacterial resistance genes found in GIs of M. haemolytica M42548 strain. The insights of GIs are evidence for the recent evolution of the most virulent strain under the study was M. haemolytica M42548. Our framework for donor prediction results revealed Haemophilus sp. is the major donor of GI regions. Further, GI Knockout studies needed for the evaluation of role of GIs in transforming commensal to virulent strain. Commensal, genomic islands, evolution, horizontal gene transfer, in silico, Mannheimia haemolytica, pathogenicity, virulence factors.